A large percentage of dogs diagnosed with atopic dermatitis (pollen or environmental allergies) and a smaller percentage of dogs with food allergy have a concurrent allergy to the flea bite, specifically a reaction to the proteins in flea saliva. This is called flea allergy dermatitis. 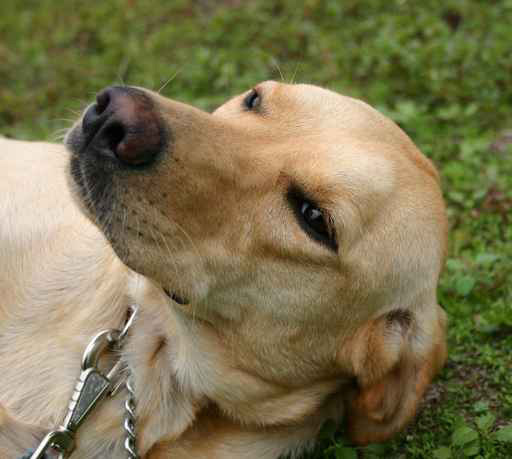 Fleas are recognized to be the most common external parasite of companion animals. Flea allergy dermatitis most often manifests as severe pruritus over the hind end: on the back near the tail, inside of the hind legs, the abdomen and the sides of the abdomen. Statistics suggest that 80% of flea allergy dermatitis patients will be found to be completely flea free. This is because pets, especially allergic pets, are excessive groomers and because it only takes the bite of one flea to exacerbate allergic symptoms. Flea control is a challenge because the adult fleas cause the clinical signs, yet the majority of the flea population (egg, larvae and pupae) is found off the pet in and around the home and yard. A moist, warm environment with relative humidity of 75% to 85% and a temperature of 65 to 80° F is most favorable for the rapid completion of the life cycle of the flea. Fleas can continue to complete their life cycle even if temperature and humidity falls outside this ideal range. The entire life cycle can be completed in as few as 16 days. For the pet with flea allergy dermatitis 100% flea control is required to remain symptom-free. Even minimal exposure may perpetuate the itch/scratch cycle. The ideal flea control program targets the various stages of the flea life cycle, not just the adult fleas on the pet. In some cases, a multi-product plan for the pet with flea allergy dermatitis is sufficient. Therapy may be recommended for the house and yard in cases of severe infestation.